CARSON, Calif. (AP) — Philip Rivers and the Los Angeles Chargers offense have been sensational during their six-game winning streak. The veteran quarterback noted this week as they prepare for Sunday’s game against the Denver Broncos that things can turn south quickly. The Chargers (7-2) have one of the league’s most-balanced offenses. Rivers is third in the league with a 115.4 passer rating and running back Melvin Gordon is third in yards from scrimmage (1,033). Rivers has been sacked only 12 times, third least among quarterbacks who have started nine or more games. 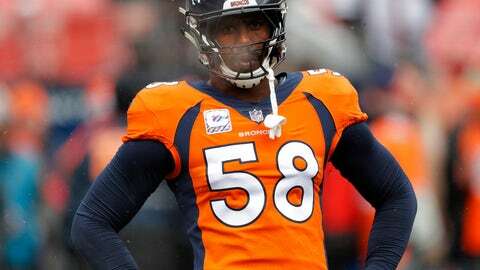 But the Broncos have one of the NFL’s best pass-rushing duos in Von Miller and Bradley Chubb, who have combined for a league-high 17 sacks. Miller, who has nine sacks this season, has sacked Rivers 15 times since entering the league as the second overall pick in 2011. That is the most by an active player against an active QB. Miller added that the biggest difference with the Chargers this season is they are relying more on the running game with Gordon and Austin Ekeler, which has allowed Rivers to take fewer risks. Chubb, the fifth overall pick in last April’s draft, has 6 1-2 of his eight sacks over the past four games. Chubb said he got to meet Rivers last season at North Carolina State when he came in to talk to the team. Rivers is tied for fourth in the league with 21 touchdown passes and has thrown two or more in nine straight games. Only five quarterbacks have done it in 10 or more straight games. He has thrown two or more TDs the past three times the Chargers have faced the Broncos. Denver (3-6) is rested after having its bye last week, while the Chargers return to StubHub Center for the first time in six weeks. Chargers coach Anthony Lynn said he sees a lot of similarities between this year’s Broncos and his team last year, which was 3-6 before winning six of its last seven. Gordon has five straight games of at least 120 scrimmage yards and a touchdown. Only four players in NFL history have done it in six straight games or more. Coincidentally, the last to do it was the Chargers’ LaDainian Tomlinson in 2006. Broncos RB Royce Freeman, who has missed the last two games due to an ankle injury, is likely to be back for this week. Freeman is part of a prolific rookie trio that also features RB Phillip Lindsay and WR Courtland Sutton. They have combined for 1,462 yards from scrimmage, sixth-most yards by a rookie trio through nine games since the 1970 merger. Broncos star Chris Harris Jr. is hardly being challenged by quarterbacks this season. In his last game, he locked down on Texans No. 1 receiver DeAndre Hopkins and was only thrown at twice. But he knows that will change Sunday. With Matt Paradis on IR with a broken right leg, Connor McGovern will get his first start at center Sunday after moving over from right guard. QB Case Keenum said losing Paradis puts a lot more on everyone’s plate. Chargers DE Joey Bosa is back practicing and could he see action. Bosa has missed the first 10 games due to a bone bruise to his left foot, but will be a game-time decision. The Chargers struggled with their pass rush early this season, yet have 15 sacks over the past four games.